I’m delighted to be joined today by Ishihara-san, from The Pokémon Company1, and Nagahata-san and Tomie-san from Spike Chunsoft2. I’d like to ask you all about Pokémon Mystery Dungeon: Gates to Infinity. 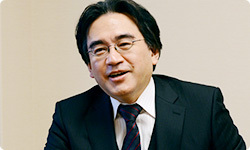 Ishihara-san, you have appeared in a number of Iwata Asks interviews, so I don’t think there’s any need for you to re-introduce yourself! (laughs). Nagahata-san, you’re someone who’s been involved with the Mystery Dungeon series from the start, and you have worked on titles such as Torneko no Daibōken3 and Shiren the Wanderer4. Could you tell us what your involvement was with this game?1. The Pokémon Company: The company responsible for managing the Pokémon brand and operating Pokémon Centres in seven locations across Japan. The company was established in 2000 and has its headquarters in Tokyo.2. 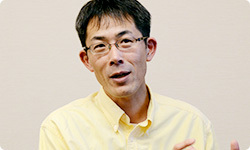 Spike Chunsoft Co., Ltd.: The developer responsible for planning, development, sales, and operations on series such as Pokémon Mystery Dungeon and Shiren the Wanderer. The company was established in 2012, and has its headquarters in Tokyo.3. Torneko no Daibōken: A part of the Mystery Dungeon dungeon-based RPG series. The first title in the series, Torneko no Daibōken: Fushigi no Dungeon, was released in Japan for the Super Famicom in September 1993.4. Shiren the Wanderer: A part of the Mystery Dungeon dungeon-based RPG series. The first title in the series, Mystery Dungeon: Shiren the Wanderer, was released in Japan for the Super Famicom in December 1995. I was responsible for overall planning and direction for this title. I see. And what was your role, Tomie-san? In the past, I’ve worked on scripts and storyboarding for the Shiren the Wanderer series. On this title, I was mainly responsible for writing the script. Well, it’s very nice to meet you all! Now then, since this is the first Iwata Asks appearance for the Pokémon Mystery Dungeon series5, I’d like to start by asking how Pokémon Mystery Dungeon came about in the first place. I suppose it all started with you, Ishihara-san?5. Pokémon Mystery Dungeon: A part of the Mystery Dungeon series, based on Pokémon characters. The first titles in the series, Pokémon Mystery Dungeon: Blue Rescue Team and Pokémon Mystery Dungeon: Red Rescue Team, were released in November 2005 in Japan and November 2006 in Europe. Blue Rescue Team was released for Nintendo DS, while Pokémon Mystery Dungeon: Red Rescue Team was released for the Game Boy Advance. Understood! (laughs) Well, Chunsoft and I have had a working relationship ever since we were both involved in a Famicom game called Tetris 2 + Bombliss6. One of the main factors that led to the creation of Pokémon Mystery Dungeon, however, was the way I felt after playing Torneko no Daibōken. I was really surprised by the depth and quality of that game. Mystery Dungeon games have their roots in old-school RPG titles, the type they often call ‘roguelike’7 games.6. Tetris 2 + Bombliss: A puzzle game released in Japan for the Famicom in December 1991. Ishihara-san was the producer and the director was Koichi Nakamura (former president of Chunsoft, current president of Spike Chunsoft).7. 'Roguelike': Derived from a game called Rogue, a dungeon-exploring computer RPG, developed for Unix systems in 1981. Games that are said to use a similar format to Rogue are collectively known as ‘roguelike’ games. Ah yes. ‘Roguelikes’ are dungeon-exploring RPGs in which the map is altered every time you play, with the terrain and the locations of items and monsters also changing. This gives the games a depth that means you can play them over and over again without getting bored. The game that was really crammed full that kind of enjoyment, while being accessible for everyone to play, was Torneko no Daibōken: Fushigi no Dungeon. At the time, the tagline for the game claimed that it was a “game you could play a thousand times” and I think that I, for one, really did! 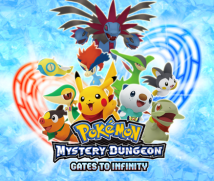 After I started working on the Pokémon games, therefore, I was always really keen to create a game that would connect Pokémon to the Mystery Dungeon series. Pokémon Mystery Dungeon was the game that arose from that desire. Have Nagahata-san and Tomie-san been your partners ever since that time? That’s right. 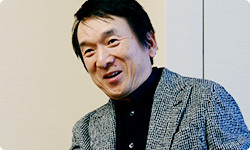 It was Tomie-san who came up with the story concept of ‘One day, you become a Pokémon!’ back when we were working on the original title, and he has been developing the stories based upon that concept. Nagahata-san, what kind of process did you go through, transforming the idea of a roguelike game into the Mystery Dungeon series? When you first set out, you didn’t know how a game like that would be received by home console owners, did you? No, we didn’t. At that time, Dragon Quest-style RPGs were the mainstream and very little was known about roguelike games, generally. So it was definitely a bit of a gamble. After all, players would sometimes play roguelike games for hours or even tens of hours, only to suddenly be dumped right back in square one with all their progress wiped out. Basically, however, all the development staff told us that this kind of game was definitely enjoyable, and that gave us the motivation we needed to get started. There’s certainly an element of ‘spiritual training’ to these games, isn’t there? They’re constructed in a really enjoyable way, but every now again they’re just so unforgiving that they make you want to cry. You were really motivated to bring that particular brand of enjoyment to as many people as possible, though, weren’t you? Yes, we were. It was a real relief that, when the game was released, more people than we expected were willing to embrace it. The path that led from the Mystery Dungeon series to Pokémon must have had its own challenges too. After all, both series have a huge numbers of rules… their own inalienable etiquette, shall we say. How did you go about compromising between the two things? My initial thoughts when I heard about this project were something like “That sounds impossible… but it would be amazing if they could pull it off!”. Such impossible combinations, when they’re done well, can really shake things up. I remember feeling the same way when I first heard about Pokémon Conquest8 as well.8. Pokémon Conquest: A strategy game, released for Nintendo DS in March 2012in Japan and July 2012 in Europe. It was developed through a collaboration between the Pokémon Company and Tecmo Koei, and combined elements from Pokémon games and from the Nobunaga’s Ambition series. The success of such collaborations is by no means guaranteed. Many people only see the risks and are reluctant to get involved. As makers of the game, why do you think you were able to overcome these obstacles? Why do you think the game was so well received? 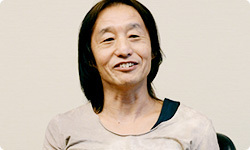 I think one of the reasons was that the script Tomie-san wrote was so good, we could incorporate it really smoothly into the structure of the game. I think we also did a good job of expressing the charm of the Pokémon through our pixel art. Tomie-san, how did you respond to the challenge of writing a script about such a tricky subject? And that was the “You become a Pokémon!” idea? Yes. That was the idea Ishihara-san decided to go with. It’s certainly the case that, when I considered game-type stories, I thought that one where the player becomes a Pokémon definitely allows for more empathy. What were your reasons for choosing this story, Ishihara-san? By combining that kind of unique aspect of dungeon-based RPG with Tomie-san’s script, I think our games are well deployed as devices that allow players to read deeper into the Pokémon legend. With the first title in the series, I felt that we’d added new elements to the type of RPG we wanted to create and broadened the game’s horizons as a result.